What’s at Stake In Burma’s Elections? Security forces went door to door, shooting anyone who emerged, including children, in a Sunday afternoon massacre. On a Sunday afternoon last August, Ahammed Hossain hid for four hours in a pond in his village of Chut Pyin, screened by bushes and thorns. Around him, he recalled, there was gunfire and the cries of men, women and children trying to outrun the deadly force of Myanmar’s 33rd Light Infantry Division. About a quarter of the village’s Rohingya Muslims, more than 350 people died that day, Mr. Hossain said, which would be one of the largest massacres by Myanmar‘s security forces since the military initiated its campaign against the minority group last year. The campaign’s death toll, estimated in the thousands, compares with notorious ethnic killings of the recent past, including Albanians targeted in Kosovo and deadly gas attacks against Kurds in Iraq. Risking death by sea or on foot, more than half a million have fled the destruction of their homes and persecution in the northern Rakhine province of Myanmar (Burma) for neighbouring Bangladesh since August 2017. The United Nations described the military offensive in Rakhine, which provoked the exodus, as a "textbook example of ethnic cleansing". Myanmar's military says it is fighting Rohingya militants and denies targeting civilians. The Rohingya, who numbered around one million in Myanmar at the start of the year, are one of the many ethnic minorities in the country. Rohingya Muslims represent the largest percentage of Muslims in Myanmar, with the majority living in Rakhine state. They have their own language and culture and say they are descendants of Arab traders and other groups who have been in the region for generations. 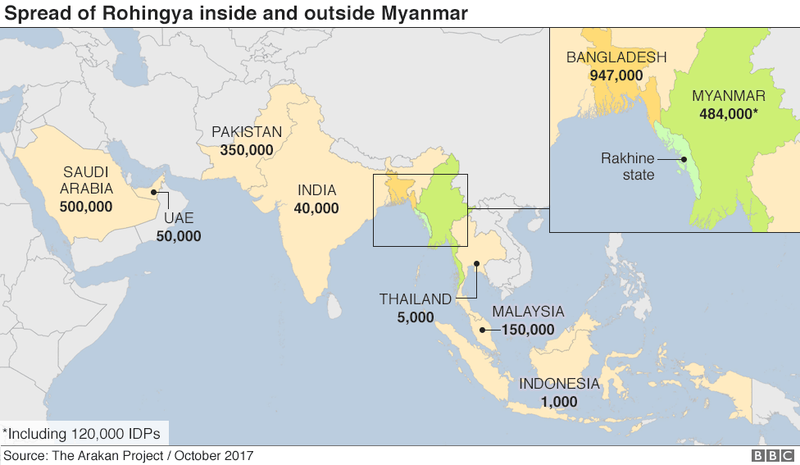 But the government of Myanmar, a predominantly Buddhist country, denies the Rohingya citizenship and even excluded them from the 2014 census, refusing to recognise them as a people. It sees them as illegal immigrants from Bangladesh.